Yep, we got about 8 inches of snow during the night, the most for this time of year since 1989, according to the paper. Welcome home, Carl! Since almost everything was cancelled, including choir tonight, I had time to do some quilting this afternoon and also finished this hat that Jill asked me to make for a friend. (Her friend is adopting a toddler from Russia.) Apparently checking out the hat was exhausting, for the next time I saw Mocha, she was sound asleep. And in another room, Ginger was also resting. I guess it was just that kind of day. On Saturday we took time off from packing up the cupboards in our kitchen for a quick drive into the foothills. We've had several clear and crisp days in a row, and the mountains were beautiful. How'd you like this view from your backyard? We drove as far as Darrington and then headed home, taking one last shot of the scenery behind us. I got a good chuckle of this photo from Jill. 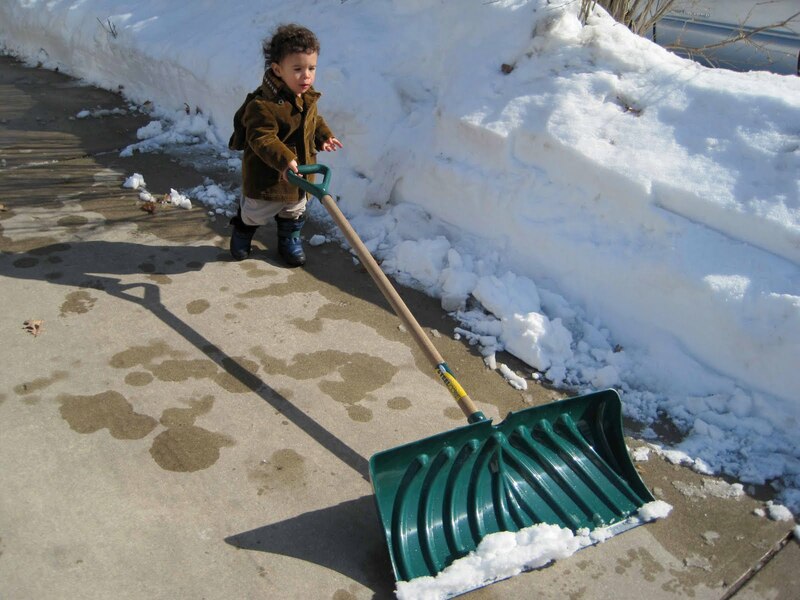 Apparently in the Midwest, the art of shoveling is taught early! Good work, Daniel! Finished up one mystery sock and am heading up the toe of #2. (I did remember the cast-on luckily.) It fits! I also made a cowl, using a pattern link Janet's website and a second pair of rainbow socks, knee-highs, this time. As you can see sock#2 is bigger than sock one for some mysterious reason. At the moment on the sewing front, I am trying to make a quilt "sandwich" on the Tutu quilt, but it's fighting me, and while I should get out my sampler, I'm heading out for lunch with a friend. Oh well. Catch you later! On to the Cuff and a Little Stitching... Finally! We still have some reminders of Christmas at our house. This lovely planter arrived at the end of November all ready to grow. It's been blooming constantly since December when the "Stars of Bethlehem" popped open. (That little flower was our troop crest in Junior Girl Scouts years ago. How did Janet know this?) Just when we thought the plants were all done, one last amaryllis appeared with a blossom in time for Valentine's Day! How fun is that? Many thanks to Mike and Janet for such a long-lasting and beautiful gift! My Christmas Sampler serves as a reminder, along with the Advent scarf, that some holiday projects remain uncompleted. This week I did do a little stitching as promised on the reindeer. Now I'm wondering why I started with the end of the alphabet? Starting from the end gets to be a habit, I think. Anyhow, the mystery sock began with the toe, a skill I wanted to learn. The last clue, the cuff, was posted yesterday. Another 17 rows and this sock WILL BE DONE! Then the challenge remains, sock #2. Will I remember the magic cast-on? Time will tell! But wait you say, "Isn't anything new happening?" Well, yes, the cupboards arrive next Friday, and the old ones are slowly being emptied. We are even getting rid of a few things. Shocking, isn't it? And on our walks we are noticing that the moles think spring is coming. Destructive little buggers, aren't they? We are SO glad this isn't in our yard.....yet. Last week was pretty crazy. We are getting ready to update our kitchen and spent quite a bit of time trying to decide exactly what we wanted to do before ordering the new cupboards. That left little time for blogging or stitching. I did, however, make a little progress on my mystery sock. Actually I have finished clue 3 which includes the gussets, but this photo only shows clue 2. This pattern requires some concentration, and I ended up doing some ripping on the third clue because I hadn't read the row numbers correctly. Certain felines were somewhat interested in my progress on clue #3. Too bad they couldn't give me any advice! Their catnaps take precedence over absolutely everything. Even though we were busy, we managed to keep up with our walking. One afternoon we noticed something quite intriguing near the sidewalk under the pines: leaf skeletons! Neither of us had seen anything like this before and later brought some more home to put in a vase. We think they are rhododendron leaves. Check out the neighbor's garage door! Here's the promised recipe for those of you who were interested. It freezes well, too! As for me, I'm off to work on letter "R," that reindeer. Fold in sweetened cranberries and pour into large greased loaf pan. Bake at 350 for 1 hour. Cool and remove from pan.